Domenichino, who is renowned for his large-scale frescoes, history paintings, and altarpieces, became Italy’s leading classical painter in the first half of the seventeenth century. Trained at the Carracci Academy in his native city of Bologna, he came to Rome in 1602 to work under Annibale Carracci at the Farnese Palace. 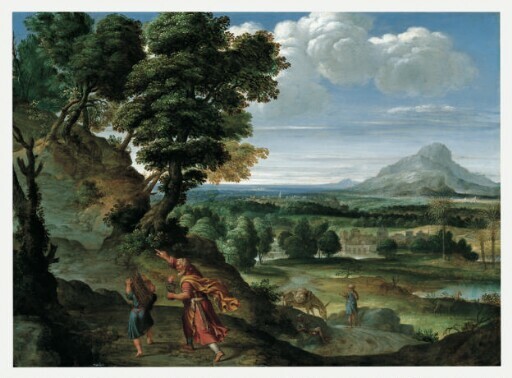 Abraham Leading Isaac to Sacrifice, which appears in the January 1603 inventory of the collection of Cardinal Pietro Aldobrandini, the powerful nephew of Pope Clement VIII, was inspired by the naturalistic and carefully constructed landscapes of Annibale. Its composition and refined technique also recall the panoramic landscapes of Flemish artists such as Paul Bril, who had settled in Rome a generation earlier, and anticipate the classical landscapes of Claude Lorrain and Nicolas Poussin. Domenichino depicts Abraham leading his beloved son Isaac to be sacrificed at God’s command (Genesis 22:1–14)––a subject regarded as a prefiguration of God’s own sacrifice of Christ. Later, when Abraham takes up his sword to kill his son, an angel will stop him, indicating a ram as a substitute. by descent to her son, Cardinal Benedetto Pamphili [1653-1730], Palazzo, via del Corso, Rome, until at least 1710. (sale, Bryan, London, 26 December 1798, no. 91, purchased for 150 guineas by Mr. Ward, possibly bought in). (Possibly Clarke and Hibbert sale, Christie’s, London, 14 May 1802, no. 56, bought in, £131.5). (anonymous sale, London, 11 June 1804, no. 18). (Hill et. al. sale, Christie’s, London, 3 July 1811, no. 93, bought in, 180 guineas). (sale, Christie’s, London, 30 June 1820, no. 95). purchased through (Thomas Agnew & Sons, London) by the Kimbell Art Foundation, Fort Worth, 1982.